How to calculate the expiration date of an Elastomer? 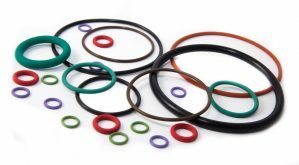 The elastomer industry uses the old Military specifications and preset SAE Aerospace references to determine rubber and O ring shelf life. It is calculated in quarter-year units submitted as 1Q21, which means the first quarter for the year 2021. As the product cure date can arise anytime within the quarter, the shelf expiration time does not start until the first entirely complete quarter. An elastomer cured on 30th October 2021 would, therefore, have a cure date displayed as 4Q21, however, would not start ageing for expiration date purposes until 1st January 2022, which is expressed as 1Q22. 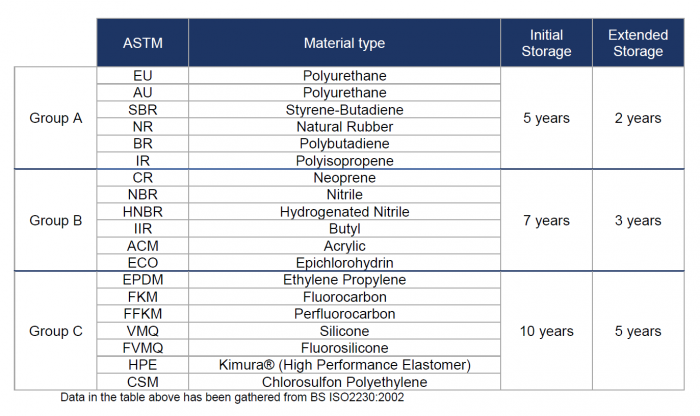 Based on above example, an elastomer with 3 years of shelf life, would not expire until 1st January 2025 (1Q25). Rubber shelf life is not a precise science as it is considerably influenced by handling and also by storage. We will mark shelf life and expiration date to client’s demand according to their speciality and intelligence of their own handling, usage, storage and installation judgment. In the appropriate circumstances, parts can be stored for the period of time indicated in the table below. Once this time has expired, the components must be visually tested for persistent deformation, mechanical damage, hardening, softening or cracks. However, if any of these are found, the articles must be disposed of. If the components are sufficient, additional testing should be performed to assure their execution features remained unchanged. The components can then be stored for the ‘extended storage’ term prior to additional testing and analysis is required. As they age, elastomer seals can encounter variations in physical characteristics and become unserviceable due to expansive softening, crazing, hardening, cracking or other surface degradations. These variations, therefore, may be an outcome of one or a number of characteristics, including the action of ozone, oxygen, light, oils, humidity, heat, water or other solvents. These damaging effects can be minimized by adequate storage conditions. Curing is the heat-generated method by which the long bonds of the elastomer particles become cross-linked by a vulcanizing agent to create three-dimensional flexible compositions. The cure date is the date that the elastomer is entirely moulded in this procedure. The uppermost timeframe, from cure date a rubber article is utilized as a part of application, sub-application or configuration. Throughout the shelf lifetime, the stored product is presumed to maintain its features, as primarily stated. Elastomers anticipated lifetime or the satisfactory period of use in service. Furthermore, it is the duration that any produced element can be presumed to be ‘functional’ or sustained by its producer. As rubber elastomers are used in numerous products, the service life would be reliant on the considerations that affect the service life of a rubber elastomer in a complete product, they include cracking, wear, corrosion and heat. E & OE. Data provided by manufacturing supply partners.